A Window Into Our World. . .: In the Spirit of Thanksgiving. . .
Brynn came home from school the other day with a craft. She had to tell something that she was thankful for. I about peed my pants when I read this. 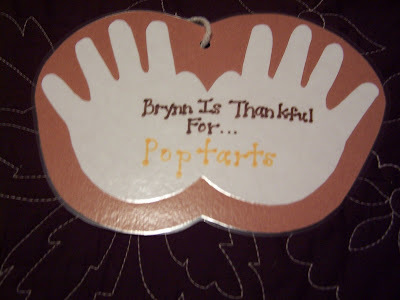 Of all the things to be thankful for my daughter chooses Poptarts! I think her class must have been making this the morning we were running late and she was finishing her breakfast walking into to her classroom. I am bad mom I know. I'm glad to know someone is thankful for poptarts.